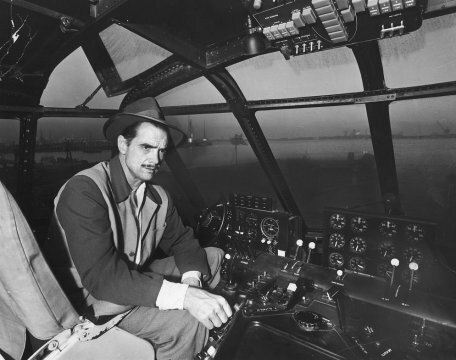 Industrialist, record-setting aviator, movie mogul, recluse — Howard Hughes was one of the most accomplished and mysterious figures America has ever produced … and, in the end, one of the most pitiable. 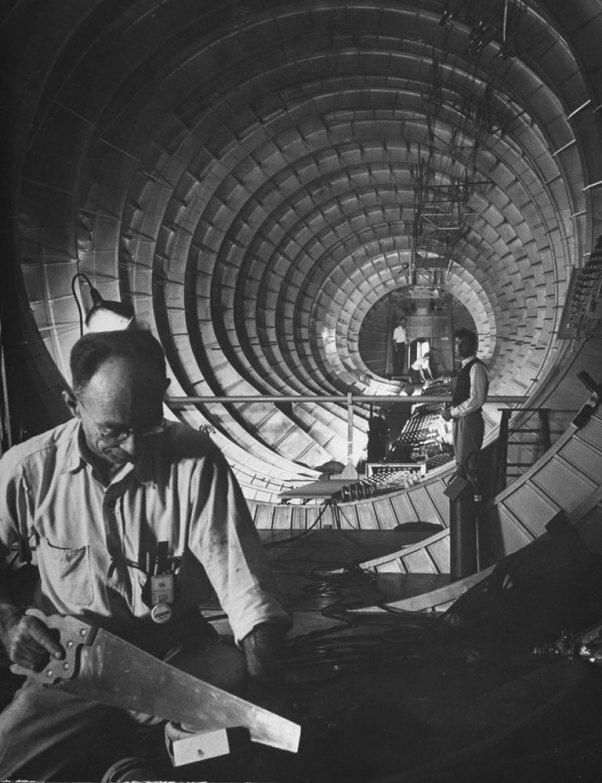 An almost preposterously wealthy and dashing figure of the 1930s, Hughes was an engineering prodigy who, even as a young boy growing up in Texas, pushed the proverbial envelope. In 1916, when he was 11, he built the first radio transmitter ever used in Houston. 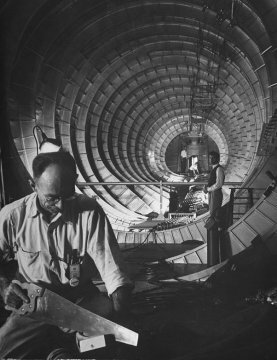 He was forever tinkering with engines and electrical devices, re-designing and making them more efficient, more powerful, more useful, better. By the time he was in his early 20s, he had discovered another lucrative talent, and was living the high life in Los Angeles, producing movies. And in everything he did, whether backing films or flying and engineering fast (and faster, and faster) planes, Hughes was a hands-on kind of guy. 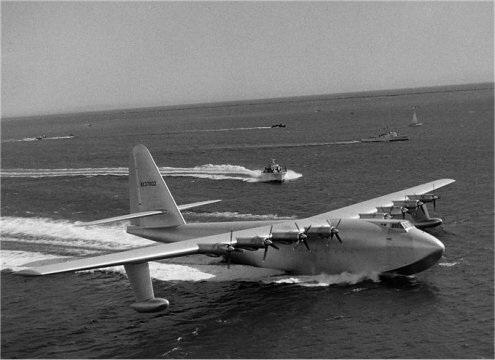 Despite its enormous size, the Hercules was meant to be flown with a crew of only three people. 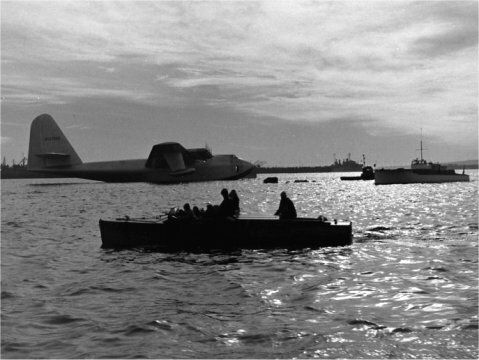 Its planned “cargo,” meanwhile, was beyond impressive: up to 750 fully-equipped military troops, or one 35-ton M4 Sherman tank. Before long, however, his contributions — as well as his integrity and his honesty — would be severely questioned by elected officials who never had much use for the flamboyant Hughes. 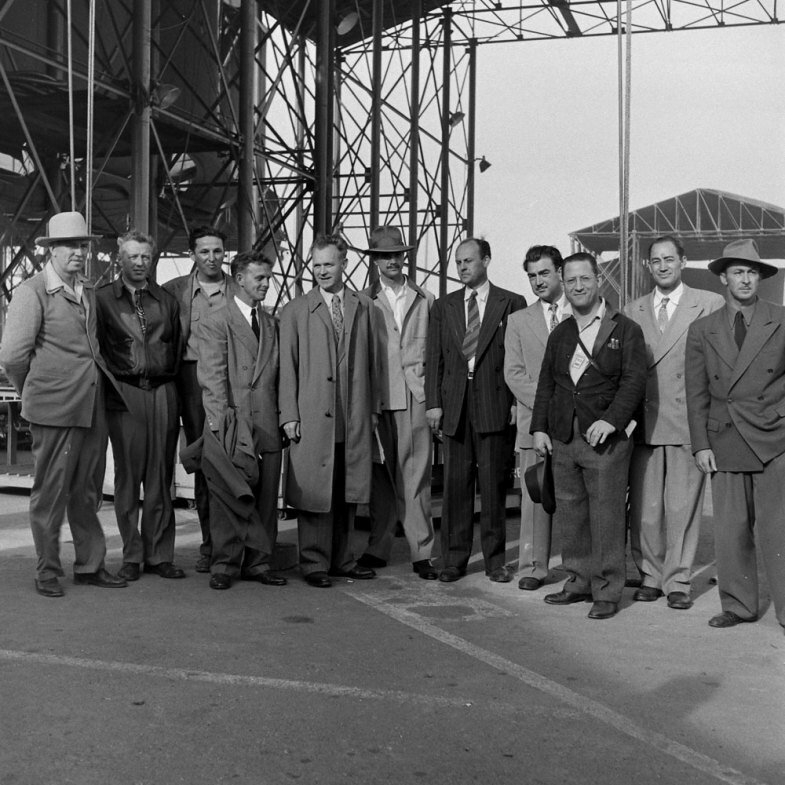 In 1947, for example, he was compelled to testify before a Senate committee led by Sen. Owen Brewster (R-Maine). 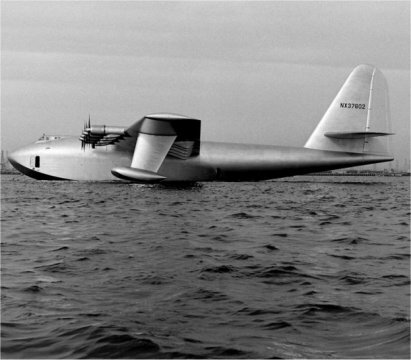 Brewster effectively accused Hughes — at the time, the head of TWA, in addition to his myriad other projects and businesses — of misusing $40 million in government funds during the development of two planes: the Hughes Aircraft XF-11 and the H-4 (the Spruce Goose), neither of which was ever successfully delivered to the government. Brewster claimed that the H-4 was a classic and disgraceful boondoggle and would never, ever fly. 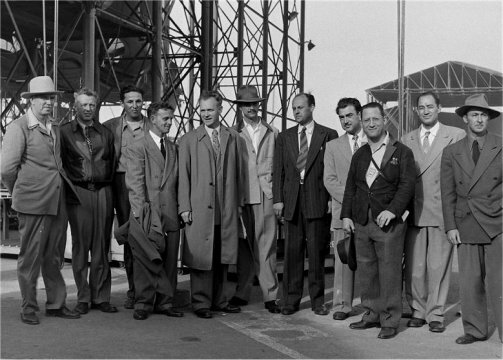 On November 2, 1947, for a few minutes at least, Hughes famously proved him wrong. 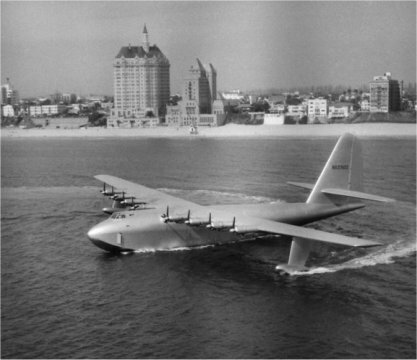 With co-pilot Dave Grant and assorted engineers and mechanics, Hughes flew the monumental plane (its wingspan of 320 feet remains the largest in history) for about a mile, roughly 70 feet above Long Beach Harbor. The plane never flew again — but Hughes felt vindicated. 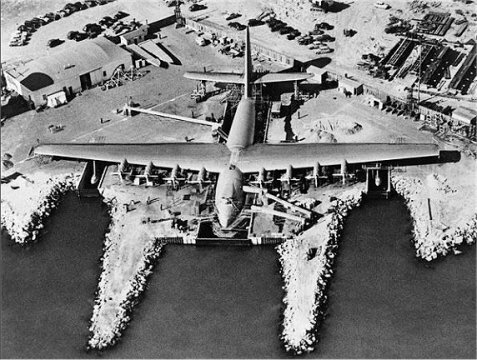 All the controversy and political palaver around the plane’s construction, meanwhile, obscured something about the H-4 that, to this day, is often overlooked in any discussion of the mammoth aircraft: namely, its sheer, sleek aesthetic power. 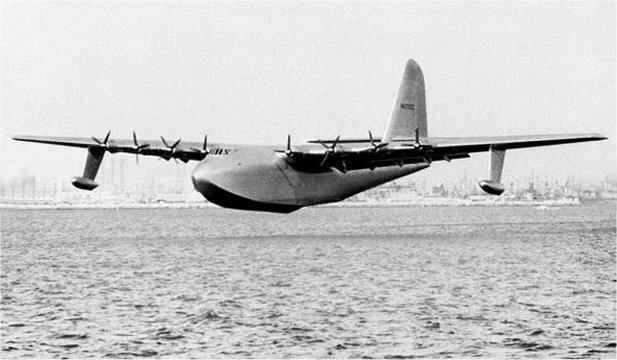 Putting aside for a moment the technical complexities and challenges inherent in designing a flying vessel the size of the Hercules, one can do a lot worse than focus on the beauty of the thing. 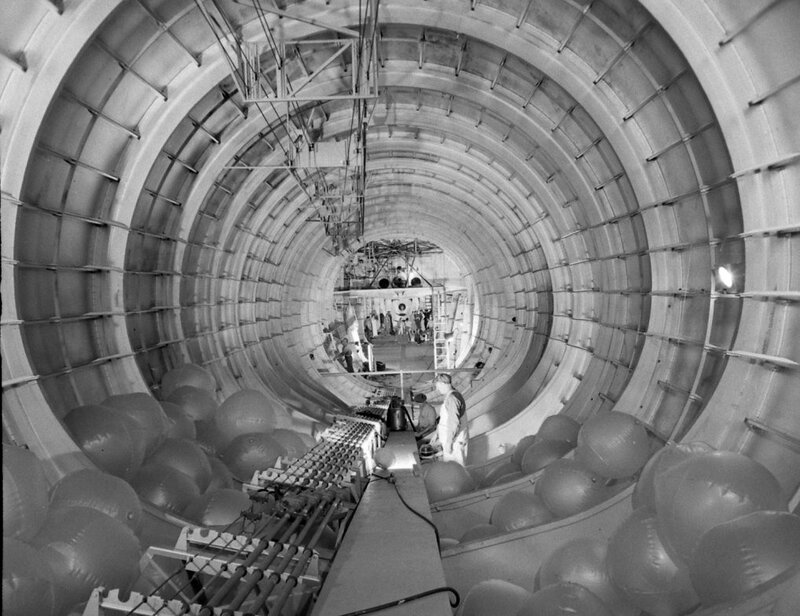 As an object, the Hercules looks like something Brancusi might sculpt — if the great Romanian artist dabbled in aeronautics and wished to create a work 220 feet long, 25 feet high and 30 feet wide. 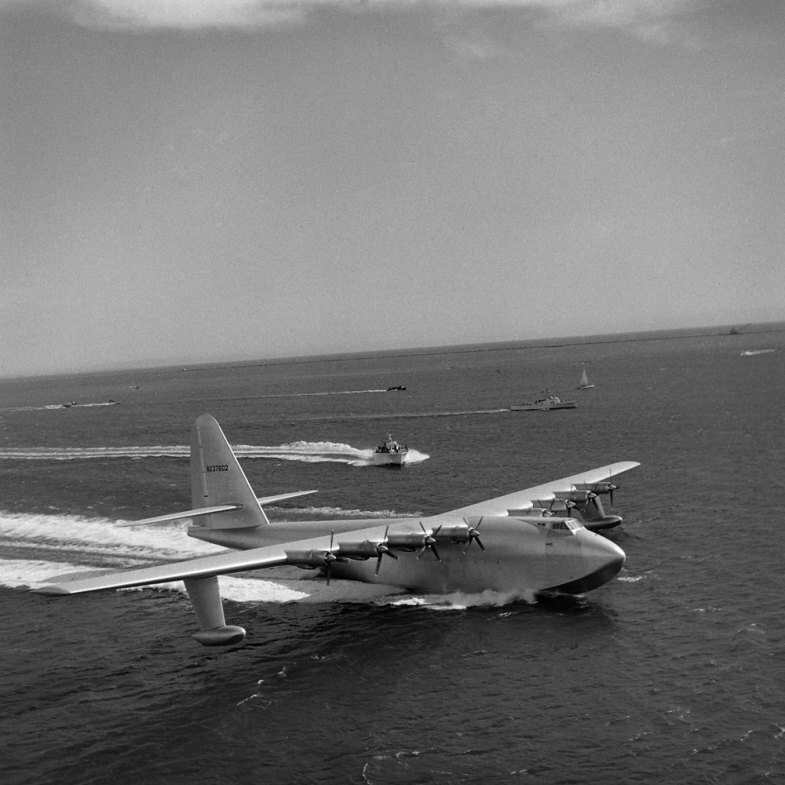 We offer here a series of photos of the largest “flying boat” ever built and the aviation genius who designed and flew her. As the years passed, Hughes retreated deeper into a severe obsessive-compulsive disorder, drug abuse and the debilitating, deadening isolation for which he later became so famous. By the time of his lonely death in April 1976, he had devolved from a rakish, even debonair man of the world into a skeletal wreck. Postmortem x-rays revealed hypodermic needles (likely used to inject codeine, to help manage his chronic pain) embedded in Hughes’ arms. His six-foot, four-inch frame weighed roughly 90 pounds. His hair and nails had grown freakishly long. He was wholly and frighteningly unrecognizable. He was 70 years old. 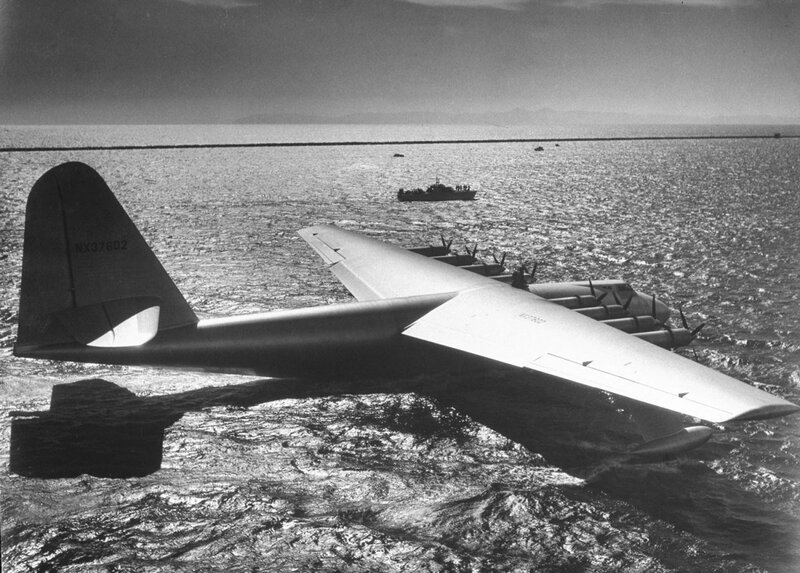 Howard Hughes' H-4 Hercules troop transport plane, the "Spruce Goose,"
Long Beach Harbor, Calif., November 1947.
troop transport plane, the "Spruce Goose," November 1947. 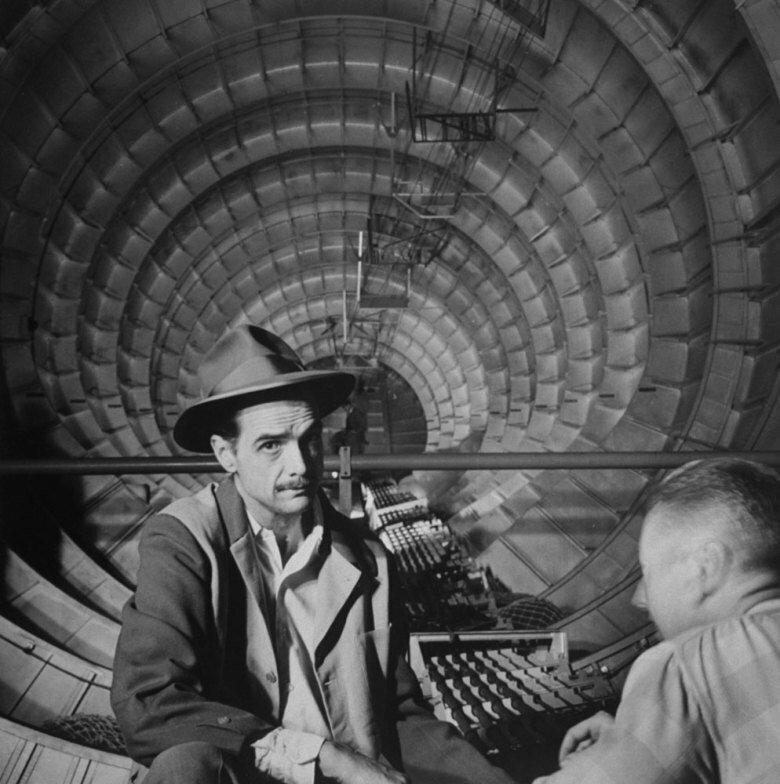 Howard Hughes inside his H-4 Hercules. 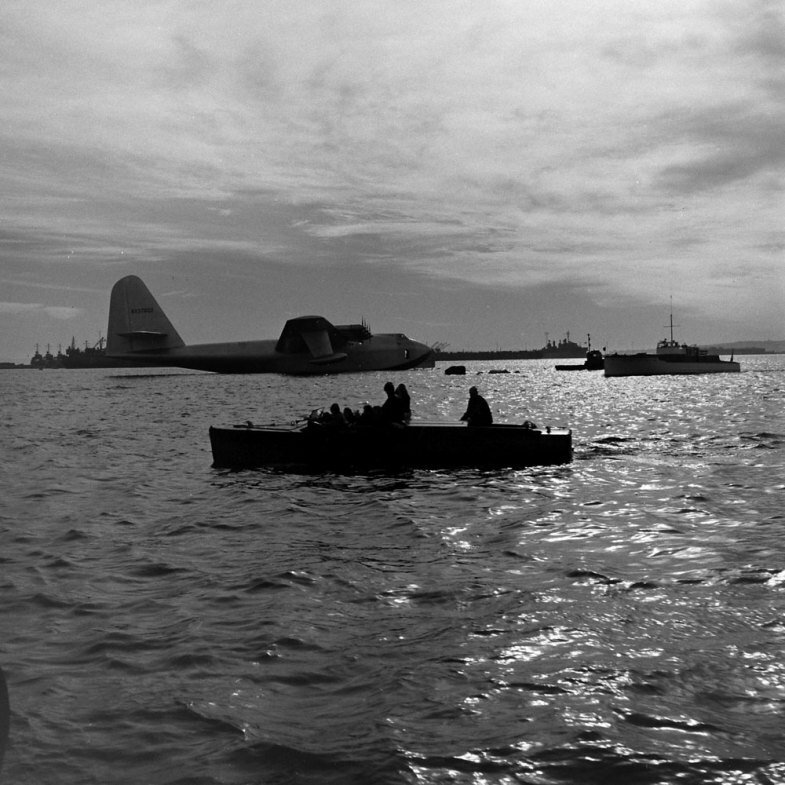 during check-ups before test. .
the plywood [sic] plane two days before the run. 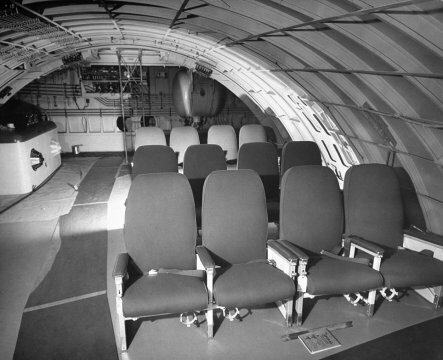 which holds most of the passengers. 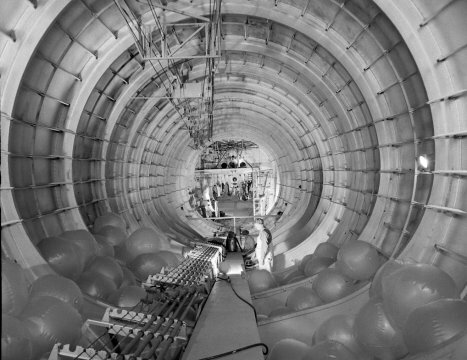 expected to go along on test, go unused. 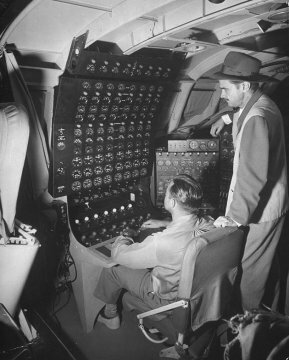 but a CAA [California Aviation Alliance] observer. 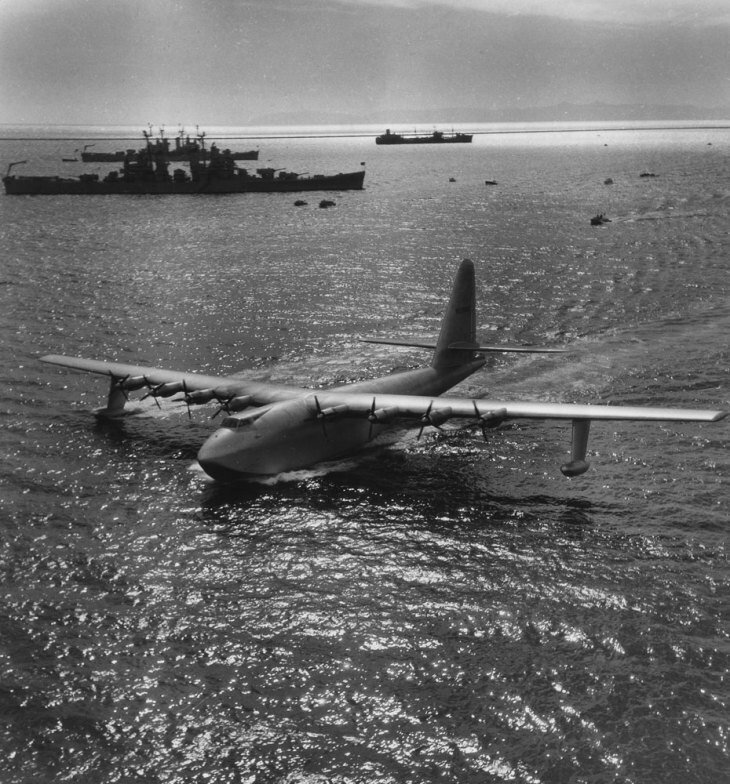 The "Spruce Goose," Long Beach Harbor, Calif., November 2, 1947..
H-4 Hercules in Long Beach Harbor, Calif., November 2, 1947. 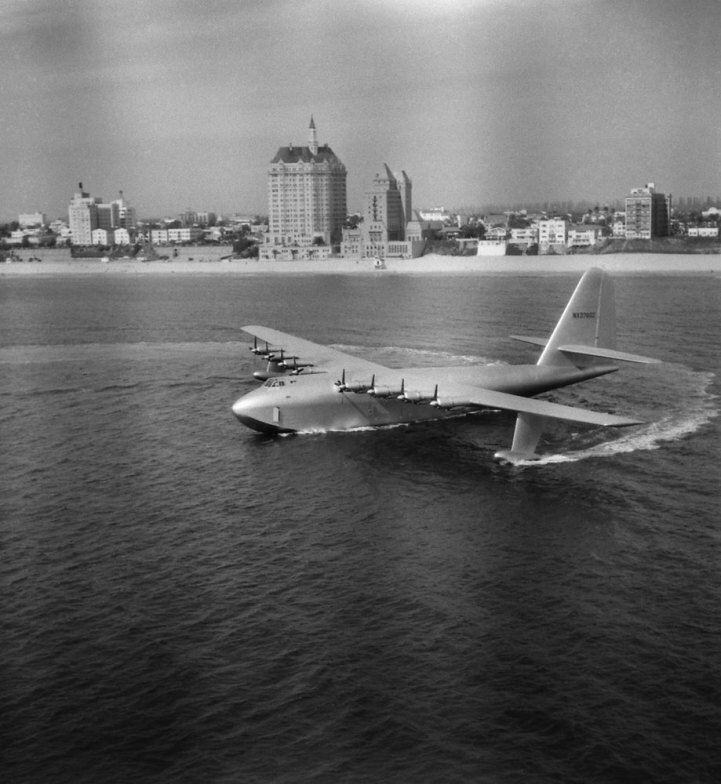 Long Beach Harbor, Calif., November 2, 1947.
the world's biggest plane taxis majestically just before its flight. 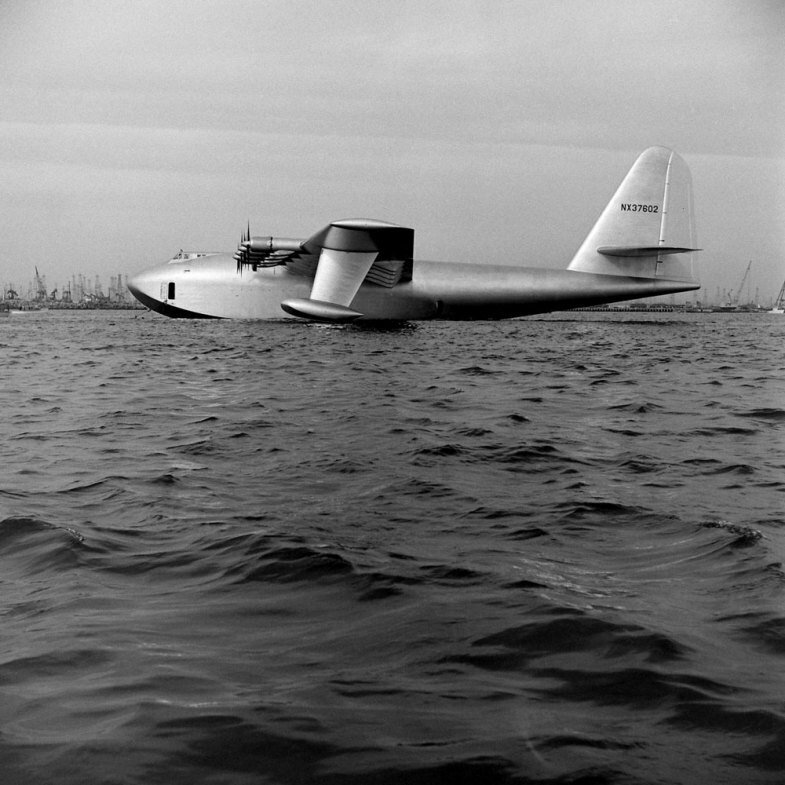 Take-off: Howard Hughes' H-4, the "Spruce Goose." 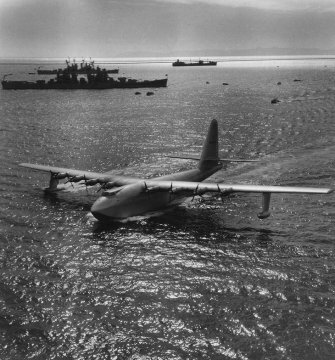 Liftoff on the inaugural (and only) flight, and only flight of the H-4.